Is this third time lucky for OnePlus? The OnePlus 3 is official after its space station launch - in virtual reality – and the Chinese firm has dialed up its formula for 2016 to give the big boys something to worry about again. It offers a 5.5-inch full HD AMOLED display, Snapdragon 820 processor, a massive 6GB of RAM, 16MP rear camera, 8MP front snapper, fingerprint scanner, 3,000mAh battery with fast charging and an all-new full metal body. And the price? Just US$399 (£309, around AU$550) – making it almost half the price of the handsets it's attempting to compete against, the likes of the Samsung Galaxy S7, HTC 10, iPhone 6S and LG G5. It is a touch more expensive than the OnePlus 2, but given the improved design it's not a huge surprise. There's more good news for OnePlus fans, as the startup has ditched its controversial invite system, meaning anyone can go online and order one. 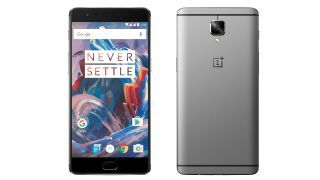 You may have to wait a few weeks for delivery – depending on demand – but it should be much easier to get hold of than the OnePlus One and OnePlus 2. While the OnePlus 3 delivers impressive bang for buck value, there are a few areas where costs have been cut. The screen is one of the key features, with resolution stuck at full HD whereas high-end 2016 flagships boast QHD panels. At 5.5 inches, the OnePlus 3 is one of the bigger phones on the market too, with no smaller variant (like the S7, S7 Edge and iPhone 6S, 6S Plus) to suit those with smaller palms and pockets. While previous OnePlus flagships have come in two storage variants, the OnePlus 3 is available in 64GB only – and there's no microSD slot either. The reasoning, OnePlus found 90% of its customers opted for the larger storage size with previous handsets, and the microSD slot - OnePlus claims - doesn't provide a seamless enough experience for users. Has OnePlus done enough to convince you that it still has the ability to compete, or is there something major it's left out? Let us know in the comments below. John McCann is TechRadar's UK Phones, Wearables and Tablet editor, bringing you all the latest news, reviews and features from the world of mobile devices. He's been using the OnePlus 3 for over a week. Hit him up on Twitter, @jjmccann, if you have any questions.